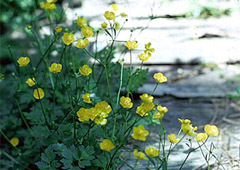 Wide and spreading with sunny yellow blooms, Creeping Buttercup is a cheerful addition to naturalized plantings, though probably too aggressive for more formal borders. Requires regular maintenance to keep from spreading too aggressively. 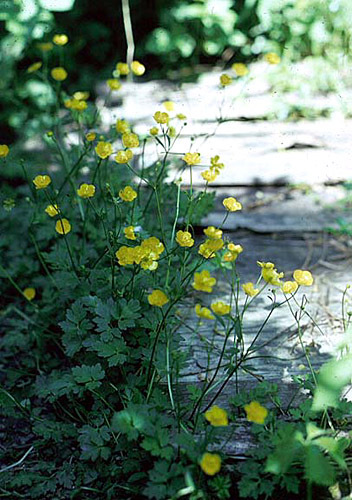 Flowers borne on erect stems up to 2� long. aggressive - Spreads by stoloniferous stems and self-seeding. not native to North America - Native to Europe, Asia. Propagate by seed, division or separation - Sow seed in spring. Divide in either spring or fall. Keep soil moist or foliage may fade. Remove faded foliage. Divide frequently in spring or fall to control spread. �Buttered Popcorn�: vivid yellow blooms on plants with cream and green variegated leaves. �Pleniflorus�: double yellow pompom-like blooms.